Interior of Bassett's Jewellery Store, 1938. 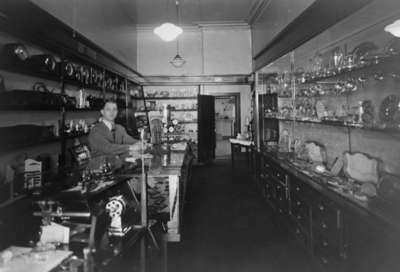 A black and white photograph of the interior of Bassett’s Jewellery Store. Silver teapots, silver plates, china and clocks are pictured. Pictured behind the counter is Mack Bassett. This photograph was taken at Bassett's Jewellery Store's second location at 106 Brock Street North. This store was first located at 106 Dundas Street West. It was the first store on the south side of Dundas Street, west of the Post Office at Brock Street. Around 1921 the store was relocated to 106 Brock Street North (on the west side of Brock Street north of Dundas Street). The store was operated by Richard Norman Bassett (1880-1940) from c.1920-1928. Richard Bassett was Mayor of Whitby from 1923-1924. Scanned from a copy negative dated 1971.